A greater number of traditional religious denominations hold that marriage is the union between a man and a woman. This statement of fact is unambiguous. And, there is a body of thought which suggests that we ought to preserve religious traditions in the same way, and for the same reasons that we preserve the Constitution of the United States. It provides a reference point from which all else that we do in this great country of ours makes sense. Nonetheless, as the technology of war has changed, we have had to make changes to our battle plans. No one brings bows and arrows being shot from horseback, to face a mechanized tank with a 50-caliber machine gun. 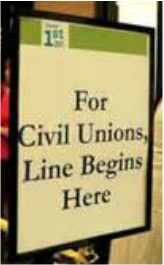 The contemporary union between any non-traditional couple should be called a Civil Union - period and full stop. This allows us to preserve our old, and yet still highly effective battle plans, while maintaining superiority by embracing and utilizing fully, tech savvy new innovations. JFK advanced the belief that there was something immoral about abandoning one's own judgment. Conceivably, it is not only unethical for the individual, but also for a nation. In the American Republic, we extend rights by expanding participation, not by taking rights away from some. It is said that it is easier to take a term with which everyone is familiar, and give it a new meaning, than it is to introduce a new term. However, it can be observed readily that some terms are more resilient and attempts to give them a new meaning solicit rather staunch resistance. As is evident clearly, the attempt to give the term marriage a new meaning can only be accomplished by forcing some to abandon their individual judgments in a realm of human conduct, which in fact and in law, is neither enumerated nor reserved, but is retained by the people themselves to practice in a sphere in which the state can make no law, and cannot establish definition. However, it is also clear abundantly that the Supreme Court did not attempt to give marriage a new meaning, but to establish, in fact and in law, an additional category of marital privilege, i.e., the civil union. What has caused the angst, anxiety and some to risk imprisonment in defiance of the Supreme Court ruling is that the several states have been slow to promulgate the necessary and sundry wherewithal to administer the civil union by officers of the court within their respective states, as the Tenth Amendment ensures. A person who is not an officer of the court is under no obligation to perform a civil union ceremony, and as well they are under no obligation not to, if they so choose. Because, civil unions are a state-administered privilege, it is within the purview of the several states to decide who can perform such ceremonies outside of those who are duly sworn officers of the court. In addition, within the scope of the ruling, any two citizens have the privilege, under the administrative procedures as established by and within the several states (when they get around to doing so) to enter into a civil union. The reality of a state-administered non-traditional marital privilege is now established and incontrovertible. 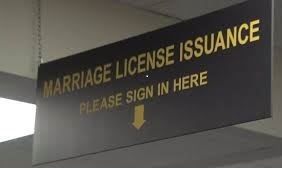 The state authorizes those who have the right to perform traditional marriages within its sovereign territory, and now certifies those who may perform civil unions within its jurisdiction. No one, other than those officers of the court, who by their voluntary sworn oath to uphold the laws and Constitution of the United States and of their respective states, can be compelled to issue a licence for a civil union. And under no circumstances may any person who is not an officer of the court be compelled to perform a civil union ceremony, unless and until they apply for and are granted the authority by the state to perform civil unions. 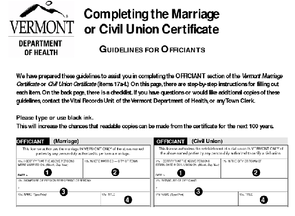 Nor can any official of a church claim that they have the right under the provisions of civil union law and regulation to perform a civil union ceremony when the doctrine of the church to which they have voluntarily submitted themselves to follow states otherwise. The law, as it now stands, does not confer protection against a church exercising its ability to severe relations with any church official, who violates the doctrines to which they have voluntarily submitted themselves to adhere. Within the realm of human conduct and association that lay beyond the sphere of the state and the courts, that is, voluntary personal beliefs, marriage as is understood and with which everyone is familiar, remains intact. In the American Republic, it is well beyond the scope of judicial, legislative, or executive authority (the state), at any level, to set in motion or in place a system of laws, administrative procedures, rules or any other enactments that would force any citizen to alter or convert their voluntary personal beliefs (the church) to accept or to even acknowledge that the state privilege of a civil union, should, ought to, or must be accepted into their established doctrine as to what constitutes a traditional marriage. To do so is well beyond the wall of separation which the framers upheld ardently. Civil unions constitute a non-traditional marital privilege administered by the several states, which lay outside the realm of a traditional marriage - no more and no less.